What is chaos? What does that word mean, in practice? And how – if at all – can we use chaos in enterprise-architecture? I’ve been having a great email back-and-forth on this with Cynthia Kurtz, co-originator of Cynefin, and – probably more relevant here – originator of the Confluence sensemaking-framework (CSF). As Cynthia said in that conversation, probably the greatest problem here is that the word ‘chaos’ is used to mean so many different things that can also be interpreted and used in so many different ways. Worse, some of those views tend to be misused as term-hijacks that block off the view to any other meaning or understanding of ‘chaos’ – which can be a real problem. We also need to clarify the difference between control, complexity and ‘real’ chaos – because there are significantly different tactics that we need for each. First. though, let’s get colloquial ‘chaos’ out of the way. In essence, that kind of ‘chaos’ is actually a sensemaking breakdown: things are happening too fast and/or with too much unpredictability for conventional order-based sensemaking to cope – hence a kind of collapse into overwhelm or whatever. In system-designs, overload under rapid change is one common cause of this. Conventional analytic sensemaking / decision-making / action loops take time to execute: so if whatever’s going on is happening faster than the system can keep up, and changes from one loop to another, eventually the decisions and actions are going to be those that should have applied to the previous loop. Which will then be the wrong decisions and actions, needing a further correction, which will also be out of sync, and then further and further out of sync, as the misalignment between sensemaking and action cascades into chaos. In a military context, the whole aim of a tactic such as John Boyd’s OODA loop (Observe, Orient, Decide, Act) is to cause this kind of chaotic collapse in the opponent. The opponent is then forced to slow down in order to regain sense – and that slowing-down then makes them a literally predictable target. There’ll also always be a moment of this kind of chaos before any attempt at sensemaking can take place. The moment we’re dumped into a new situation – or even a known situation before we know that it’s a known situation – there’s the same kind of existential uncertainty: we don’t know what’s going on, so we can’t decide what to do. (In the swamp-metaphor, that’s the state that we’re in before we decide on what kind of tactic to use – when all we know is that the swamp is, well, the swamp…) Sometimes we can kick-start the sensemaking-cycle there by taking some arbitrary form of action: “don’t just stand there, do something!” – or, as some would put it, ‘act -> sense -> respond’ as ‘the method’ to break out of the chaos. Yet as we’ll see later, that’s by no means the only available tactic there – and in many cases it’s not even a good tactic either. In essence, colloquial-chaos is loss of sense leading to a sense of loss of ‘control’. To many – especially those embedded in a linear-paradigm worldview – the obvious answer is to crank up the speed of the sense/decision/action cycle: hence the popularity of computer-based automation and suchlike. Yet although such automation is an answer that works well in some circumstances, automation alone is not ‘the answer’. All it really does is push back the boundaries of ‘chaos’: no matter how much we might wish that it could do so, it cannot ever expunge that ‘chaos’ in its entirety. To ignore or deny Chaos is a bit like denying the existence of a hole in the road – it simply increases the chance of falling into it. Colloquial-chaos occurs whenever we try to ignore or deny the reality of chaos: we need to work with that chaos, rather than try to pretend that it doesn’t exist. There are plenty of business-examples of this: for example, a buying-decision in sales will often conform almost exactly to one of the best-known of chaos-math patterns. In practice, though, this is often misused or misunderstood as just another way to put a gloss of ‘control’ over something that actually isn’t controllable at all. To understand how to make use of this in enterprise-architecture, we need to know its very real limitations. Perhaps most important is that this isn’t the mathematics of ‘chaos’ as a whole: it describes only a specific subset of ‘chaos’, such as the impact of non-linear dynamics. Although it’s different from conventional linear notions of ‘order’, in essence it’s a kind of ‘meta-mathematics’, with a role somewhat similar to the role of metaframeworks and the like: it describes the behaviour of the bounding-conditions (such as some aspects of ‘variety-weather‘) for specific phenomena, but cannot describe the exact phenomena themselves – a crucial distinction that’s too often missed. And although it does cover key concerns such as sensitivity to initial conditions, it explicitly doesn’t allow for true randomness or extreme-uniqueness – which is a significant issue in many business-contexts. Next we’d turn to what we might describe as ‘jolt-chaos‘: in SCAN terms, deliberately stepping over into uncertainty or ‘unorder’ so as to shake things up a bit. In enterprise-architecture practice, I’ve often seen at least two distinct forms of this. The first is sort-of linked to chaos-science territory: giving something a jolt to break it out of ‘stuckness’. One way to describe this is in terms of ‘attractors‘ or ‘strange-attractors‘, where a phenomenon that follows non-linear dynamics tends to fall into particular patterns with regions of relative stability. The classic real-world example is to give the (old-style analogue) television a thump in the hope of bringing it back to the desired tuning. I don’t know the details of the maths here, but I do know that old-style thermionic-valves could wander, but tended to settle into particular states: if it was a ‘wrong’ state, a mechanical jolt could often restart the dynamics, with a good chance of getting the valve to resettle into the preferred state. In effect, the jolt briefly becomes a part of the overall dynamic-system, and therefore temporarily changes the dynamics of the system. Plenty of business analogues there – the Hawthorne Effect being perhaps one of the best-known examples. The other type is where we kind of ‘dip in to the chaos’ as a source of ideas or innovation. Common business-examples to invite this type of chaos include brainstorming, gamestorming and structural-serendipity. We need this ‘jolt-chaos’ to keep things moving in business and elsewhere: Nietzsche’s oft-quoted comment that “You must have chaos within you to give birth to a dancing star” would apply to birthing anything new, really. But we do need to respect it and work with it as chaos – and not try to ‘control’ it, or pretend that it’s something else that’s easier to manipulate or understand. Finally, for here, there’s what we might call ‘infinity-chaos‘, though perhaps ‘continuous-chaos‘ or ‘intentional-chaos‘ might well be useful alternate terms. Here we don’t just dip into the uncertainty for a brief moment – as in ‘jolt-chaos’ – but instead remain in it for as long as we can or must. I’ll admit this is not easy to describe or explain, not least because to make sense of what happens here requires careful subjective observation and a mode of inquiry that doesn’t fit well with a conventional ‘truth’-based verbal form of description. Hence this whole space is very often misunderstood, or misdescribed, or just glossed-over in the search for some more-easily-understandable Belief-structure – which won’t do the job that’s required here. It often seems the best we can do in descriptions is kind of point at it, or imply it: if you’re familiar with classics such as the Tao Te Ching or the Sufi teaching-tales of the ‘wise fool’ Mulla Nasruddin, you’ll have a good sense of the more abstract and generic end of what I’m aiming for here. Yet it’s probable that the only really workable ‘description’ is to do it, whilst also observing oneself in the doing of it – which is not an easy thing to do! For enterprise-architecture and the like, what we’d look for here are strategies and tactics that support real-time action and decision-making: it’s very important not to try to define methods or whatever to do the work itself – and especially not with some form of automation. The whole point here is that in any inherently-chaotic context, we do not and cannot define beforehand the exact details of what will happen: some parts of it at least will always need to be made up on the spot, from whatever material is available to hand. So the key here is to provide an ‘option-rich’ environment and solid support for the human skills and decision-making that must apply in this type of context. Simple everyday examples (or at least, ‘everyday’ for the people who act in those contexts) would include a customer-support call-centre, the emergency-room in a hospital, or soldiers on front-line patrol in hostile territory. There’s always some aspect that’s ‘the same’, as constrained by the context and the nominal responsibilities in that context; yet there’s also always some aspect that’s different every time. And we can’t know beforehand exactly what it will be: all that we do know is that something half-known or completely-unknown to us could be thrown at us at any moment – and the decisions and actions that we take are down to our literal ‘response-ability’, in real-time, right here, right now. Note that many of these are almost the exact opposites of what usually happens in business: ‘No-But’ rather than ‘Yes-And’, for example, or ‘Serve the good of this business-unit’, or ‘Mistakes are invitations to punish’. Which might just illustrate why so many organisations have so much difficulty in coping with inherent-uniqueness or inherent-uncertainty… Again, we do need to do better than this. Anyway, stop there for now: enough to get started with, I hope? There’ll be more detail to follow in later posts – with an emphasis on practical, usable detail – but for now, over to you for any comments so far? ‹ Where’s the best place for enterprise-architecture? Hi Tom, Surely a key perspective of chaos in the rational enterprise is the relationship to the momentum business? At any point in time some areas will be in flux, and here your four types of chaos are helpful. But managing chaos is really about managing response to key stimuli such as competitive pressure, unforeseen technological churn, loss of profitability, unforeseen risks etc. In all these situations there will be Capabilities that will continue BAU, and some capabilities that are destabilized. These BAU capabilities will often be lower level layers – domain services, capability services etc. You still have customers, orders etc. The upper layers – processes, information (BI, MI, BD) and business rules, will and should be architected and engineered for maximum agility. I have observed that today most enterprises are managing by initiative. This doesn’t mean everything is in constant flux, rather new wave activity tends increasingly to be addressed in a highly discrete manner until it’s better understood. Even then it’s important to know what coordination is essential, (alignment with key EA policies such as core services, interop etc) thereby managing continuity of BAU revenue and risk. Chaos is to be encouraged. Coordination should be mandatory! Hi David – I’d agree with all of your comments as they apply at the larger scale, where in essence almost all of the ‘chaos’ that most people see will fit into the definition of colloquial-chaos. And I’d agree that most of those issues are addressed already through various forms of management, around control, coordination or complexity. What I’m most interested in here, though – and what I suspect I still haven’t explored or explained adequately as yet – is the key classical form or meaning of ‘chaos’, as an infinity of possibilities, each of which is in some way inherently unique. It’s strongly linked to the classical meaning of ‘pan-‘, as ‘the everything’ – and, in turn, to the English word ‘panic’, which hits when people fail to cope with ‘the everything’. It tends to apply either at the smaller scale – the unique ‘market of one’, for example, that applies at the exact moment of decision-to-buy – or right out at the far edge of the bell-curve – for example, the risk-difference for a small high-intensity storm in whether it impacts only on the ocean, on relatively uninhabited land, or in the middle of a densely-populated city. It seems to me there’s a huge in current management-thinking and architectural, but I’ll admit there’s more I need to do there to make more sense of it. I’d agree with the (probable!) sentiment of your “Chaos is to be encouraged”, but I’m not sure I’d agree with that specific phrasing, because it seems it could be too easily misconstrued. The reality is that chaos simply is, regardless of whether or not we’d choose to ‘encourage’ it. What we need to encourage is awareness of it, respect of it, and the skills and capabilities to work with it – rather than trying to ‘control’ it or fight against it, neither of which by definition can work. More on this in another post, anyway. In the meantime, thanks again! First is that colloquial chaos seems to be nothing more than a misunderstanding of non-linear dynamics. Because the observer is unable to fit a cause-effect pattern to events, the observer concludes that none exists. Reasonable? Second is that talking about being ‘in’ chaos is something of a misnomer. We are impacted by a chaotic system every day (weather). Whether it conforms to our predictions or not, it remains chaotic. Does it make sense to say the same about EA (and all human endeavors in general)? Hi Gene – thanks for those ‘two thoughts’! On your first, yes, reasonable – certainly for the way in which so many people try to apply linear-paradigm tactics to non-linear contexts. More generically, though, I’d say it’s more a mismatch of tactics to nature-of-context: for example, attempting to apply complexity- or chaos-mode tactics to simple low-variety contexts would often be described as ‘chaotically slow’ or ‘chaotically confusing’ respectively. On your second, about always being ‘in’ chaotic-systems, the short answer is “yes, of course”. What I must presume I haven’t explained adequately above – and again, I apologise for this – is that this is more about tactics to work with different aspects of an overall system, rather than the systems themselves. In that sense, “being ‘in’ chaos” is about intentionally using chaos-mode tactics to work with chaotic-type elements in a context, so as to mitigate risk and/or gain opportunity from those elements. As can be seen from that list of ‘improv principles’ above, those tactics are often radically different from the ones we’d use for contexts that are simple (low-variety) or complicated (high-variety) or complex (describable/predictable non-linearity) – and also often in direct conflict with many of our current management-models. What I’m trying to do here is to get a better handle on what those elements are, and what tactics work well with them, so as to identify the architectures that are needed to support those tactics. 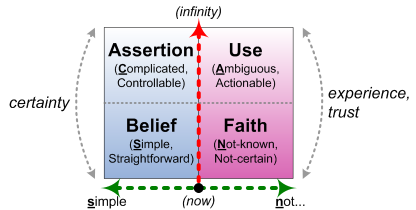 For most of our current enterprise-architectures – and particularly those that are still rigidly IT-centric – it seems to me that we’re still barely at first-base yet, namely a solid acknowledgement that chaotic elements always exist in every real-world system, and that conventional ‘control’-based (linear-paradigm) tactics not only don’t but cannot work well with them, if at all. The next challenge – and it’s one that’s caused a heck of a lot of grief for me here – is to get folks to understand that there is a fundamental distinction between complexity and chaos, and that complexity-mode tactics likewise won’t and can’t work well with true chaotic-elements in a context. So I’ll accept that there’s still a heck of a long way to go on this before we get to something that’s fully usable on this – but I do still think it’s worth the effort to do so. Your opinion, on that, perhaps? You were clear enough re: the focus of the post, I merely strayed toward the periphery of the topic. However, it did seem to tie in with what you said in your comment about acknowledging that chaos always exists (my apologies if you had made that point already and I just missed it). People only seem to recognize the chaotic nature of weather when it does something unexpected (bringing us back to colloquial chaos). Its nature hasn’t changed, it just fell outside the range of our expectations. As to this line of inquiry being worth the effort, I certainly think so. I find the subject fascinating and consider it a sign that the discipline is not becoming sclerotic. Gene – re “chaos always exists”, yes, exactly. I did kind of imply it (“pretending that we can reduce everything to ‘control’ is a dangerous fantasy – a more extreme version of the notion that complexity can somehow be eliminated from real-world business”), but I didn’t state it outright, and I should have done: my apologies. Re weather and “Its [chaotic] nature hasn’t changed, it just fell outside the range of our expectations” – again, yes, exactly. And in many ways the real problem isn’t the chaotic nature of so many things such as weather, but our expectation and near-demand that things ‘should’ conform to our expectations.